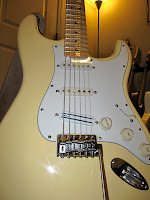 Once I decided to test my Malmsteen guitars to see if they would work for me in my band, I simply stole the pickguard off my '04 Deluxe Strat "temporarily" to see if the pickups would render the Malmsteens more usable tonewise with the music we are playing. This, of course, was a success but somehow that pickguard never made it back to my Deluxe Strat. :) It first landed on my Vintage White Malmsteen, and then found its way to the Sonic Blue (where it has remained since). I ordered a new pickguard and indentical pickup set for the Vintage White shortly afterward and now both Malmsteens are locked and loaded and ready for gigs. 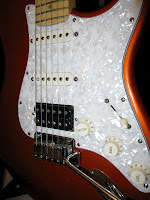 Meanwhile, my poor Deluxe Strat was in limbo with a Malmsteen pickguard loaded with Malmsteen electronics. 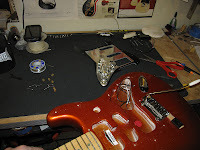 This time, to save some cash and to change up the formula a bit, I ordered a new pearloid pickguard routed for a bridge humbucker and two singles and popped in an old DiMarzio ToneZone I had lying around on my workbench for years. I originally bought it for $30 on eBay and never found anything to put it in, so it was cool to finally get to use it in something. The singles I ordered are my favorite choice, DiMazrio Virtual Vintage Blues, which I have in both Malmseen guitars as well. I am so happy with the result! This guitar sounds fantastic with the ToneZone in the bridge position. This has always been a very dark sounding Strat from the very beginning, so having the ToneZone in it makes for a pretty dark, ballsy sound with a nice open-wah like mid range and I love it! This was an excellent upgrade. The next thing I'll be doing to this guitar is swapping out the bridge with a Callaham.